A fish is a great, low-maintenance pet. However, just like all living things, fish need a steady supply of food to survive. But how much food should you give your fish at once, and what kind of food? Does it need breakfast, lunch, and dinner? Learn how to feed your fish to keep him happy and healthy. First of all, make sure you are feeding your fish the right type of food. Different species require different food to stay healthy. Do some quick research on what your fish would eat in the wild. For example, carnivores need higher levels of protein than omnivores, and saltwater species have different nutritional needs than tropical species. Consult the product label to figure out whether or not it will meet your fish’s needs, and try to find food that is specifically labeled by species. If you have any trouble selecting fish food, ask an expert sales associate for help at your local Petsway. Flakes are a very common type of fish food. 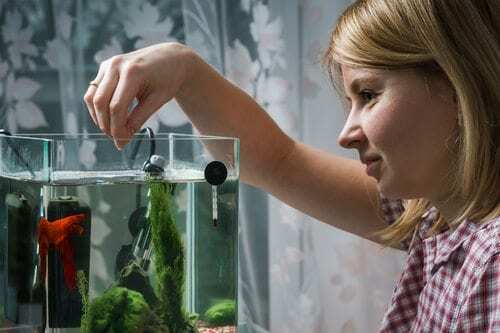 They are ideal for nearly any type of fish that will swim to the top of the tank to eat. Pellets are another option, but most pellets are intended for larger fish. If your fish is a bottom dweller, choose a pellet that sinks rather than floats. Pellets and flakes make great staples for your fish, but consider giving them freeze-dried or frozen food for a healthy, special treat. Dried seaweed is another great supplement for most fish because it is very nutritious. Most products will have instructions on the label regarding how to feed your fish. If the label says to just place a “pinch of food” in the water, make sure to figure out the right-sized “pinch.” A good rule of thumb is to not feed your fish more food than it can eat in three to five minutes. The amount of food that your fish requires will depend on its size, breed, and age. Certain fish will continue to eat even when they are not hungry, so set a timer the first few times you feed your fish to figure out how much food they can actually consume in three to five minutes. Putting too much food in the tank can cause digestive issues and make the tank cloudy and dirty (source). Most fish require food once a day. If you have multiple fish in a tank, distribute the food evenly so all the fish have a chance to eat. In addition, if you have several different species in one tank, you will most likely need to purchase different types of food and figure out the right combination. Consult a veterinarian or aquarium experts at your local PetsWay for advice if you’re concerned that you aren’t feeding your fish properly or your fish seem unhealthy. If you are going on vacation, have a friend come over and feed your fish regularly, or purchase an automatic fish feeder. Just test out the automatic fish feeder before you leave to make sure it is in good working condition. You could also try a vacation food block, which slowly releases food without clouding the tank’s water. Although some adult fish can survive without food for a couple of days, it is best to continue their regular feeding routine to ensure that they are getting all of their required nutrients. Fish make a colorful addition to any office, classroom, or household. Are you looking for the right food for your fish or perhaps even a new fish? 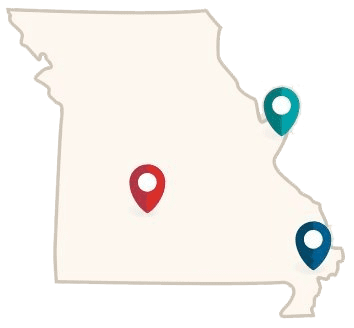 Visit Petsway if you live near Springfield, Nixa, St. Louis, St. Peters, and Poplar Bluff, Missouri. We would love to help you figure out which type of food will keep all of your fish healthy for years to come. In addition, our friendly staff can show you the best options for tanks and accessories. We look forward to helping you and your fish!